Who is better positioned to call Donald Trump out as a “faker” ignorant of the constitutional values that bind us together? A faker is someone who deceives. By making outlandish statements and then denying he said them, by telling the American people that he will build a wall along the Mexican border that he knows will never happen, by saying he will “make” China assassinate Kim Jong-un of North Korea, that he will compromise the national debt, Trump fits the definition of “faker” quite neatly. Trump, moreover, has repeatedly made campaign promises that, if fulfilled would violate basic constitutional values. He has said he would deport over 11 million undocumented immigrants, ban Muslims from entering the United States, surveil American Muslims and their houses of worship, reinstate torture, summarily execute Sgt. Bowe Bergdahl before he is even tried, compromise the national debt, and revise libel laws so he could sue journalists who dare to disagree with him. Ginsburg’s comments instantly unleashed controversy. Trump said that Ginsburg should resign (which she won’t, nor has any reason to do); that she is “dumb”; that “her mind is shot”; and that she is a “disgrace” (an insult he has so overused to characterize his political adversaries that it has become a cliché). The mainstream liberal media, led by The New York Times and The Washington Post, were editorially quick to pile on. The Times wrote: “Donald Trump Is Right about Justice Ruth Bader Ginsburg,” and accused her of “political punditry and name-calling.” The Post said that while none of “Justice Ginsburg’s disparaging comments about…Donald Trump [were] untrue, at least not as we read the evidence,” it condemned “Justice Ginsburg’s off-the cuff remarks about the campaign” as falling “into that limited category of candor that we can’t admire,” as though the Holy Grail inside the Beltway is to be admired by the Post. I would argue, however, that Ginsburg too readily caved to pressure in expressing “regret”—something short of a full apology. The only thing she did wrong was to apologize. I would argue that her “apology,” such as it was, may be seen to give Trump a healing benediction. The Code of Conduct for United States judges wisely states that a “judge should not…publicly endorse or oppose a candidate for public office.” But Trump is no ordinary candidate. And he seeks no ordinary public office. This is no ordinary election, for these are the times that try the souls of men and women. More is at stake here than whether we tax and spend wisely or make a trade deal with China or gouge students who must borrow to attend college. With as many as four actual and potential vacancies arising in the next four years, the future of the Supreme Court for decades will be in the hands of the next president. When someone such as Trump, who has repeatedly ignored the basic requirements of the Constitution, has the potential to be president, who is better positioned than a venerable justice of the Supreme Court to call him out as a “faker” who is grossly ignorant of the basic constitutional values that bind us together? 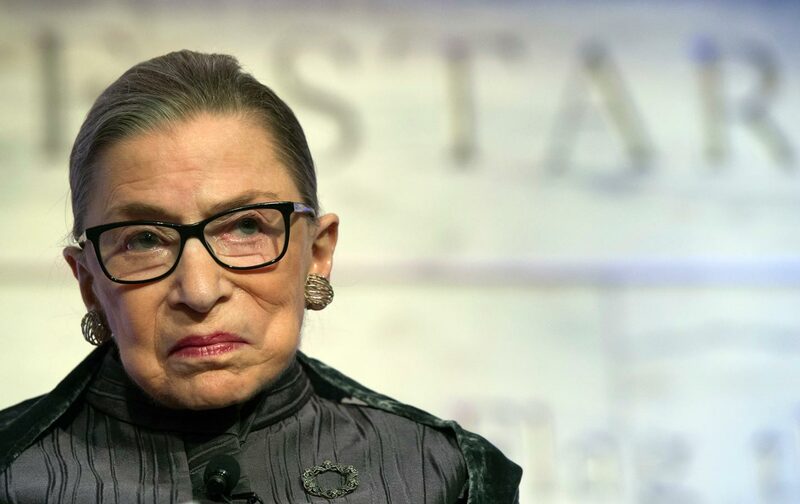 Legal ethicists agree that Ginsburg has said nothing that would be disqualifying if issues involving Trump came before the Court—even if another Bush v. Gore should arise. The late Justice Antonin Scalia and Clarence Thomas have repeatedly expressed extrajudicial opinions on matters that regularly come before the Court such as abortion, homosexuality, affirmative action, and capital punishment. And when the Republican Senate abdicates its responsibility to consider duly appointed justices, it should not be surprising that Americans of courage and principle such as Justice Ginsburg speak out in protest and horror at the politicization of the judiciary. These are dangerous times in this country. If you believe that the Constitution and basic values are imperiled by a Trump presidency, who better than a respected Supreme Court Justice to sound the alarm and courageously remind us that America matters? James D. ZirinJames D. Zirin, a lawyer, is the author of the new book Supremely Partisan—How Raw Politics Tips the Scales in the United States Supreme Court.